"At first I thought that it would be any other assembly, but I had no idea it would be so good. It is just so incredible to have them come here. Thanks, whoever arranged [Jeh Kulu] to come." - Adam E. Jeh Kulu School Programs: Jeh Kulu Dance and Drum Theatre has been working as artists in residence in schools throughout Vermont and New Hampshire for over ten years. 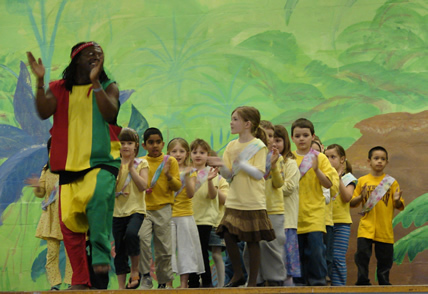 Our artists hail from Guinea, Senegal, and USA, and have been bringing the culture and spirit of West African drumming and dance to children all over the northeast. We are delighted that you are interested in bringing Jeh Kulu to your school. We offer a variety of programs in order to work within your budget while fulfilling the educational goals you have for your students. Whether you bring Jeh Kulu as a part of your music, French, social studies, or physical education curriculums, or as an enrichment to cultural and diversity programs, special celebrations, or health and wellness, Jeh Kulu will provide a memorable experience your students are sure to love. Performances: Our performances include energetic dance choreography, live drumming by highly trained artists, an introduction to traditional instruments and audience participation. Performances generally range from 35-60 minutes and are perfect for events such as cultural fairs, end of the year celebrations, memorable assemblies, MLK day or black history month celebrations. Workshops:We offer 60-90minute dance and drum workshops for all ages. Dance workshops can accommodate the typical class size or larger groups of up to 35 students. Drum workshops are limited to groups of 10-15 unless the school can provide additional instruments. Students will learn a sequence of traditional dance steps or several parts to a traditional polyrhythm taught by master artists. Residencies:Residencies range from one day cultural education/demonstration, to two or three week in-depth teaching of dancing, drumming, and culture culminating in an all school performance. Student performances, presentation s by our company, or a combination of the two are a great addition to any residency package. 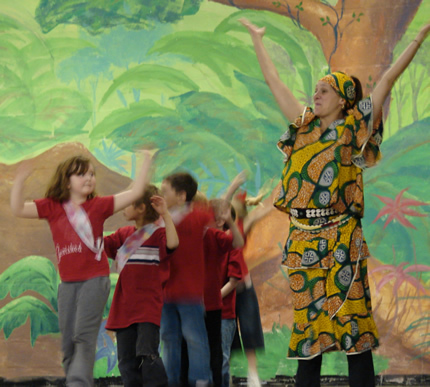 All residencies can include a combination of drum, dance, and cultural education and involve your students learning one or more traditional dance or drum pieces, a brief introduction to traditional instruments used during the residency, and question and answer time with master artists from West Africa. Depending on your budget and goals we offer several different packages and we can accommodate the focus to best meet your goals. * Longer residencies allow for more tailored focus and we work closely with teachers to determine the best fit. See below descriptions of common options. Students will have a memorable immersion into West African dance and drum culture through learning traditional rhythms, brief Q and A with Master artists, and an introduction to traditional instruments. Student performances are possible as well. Additional fees apply. 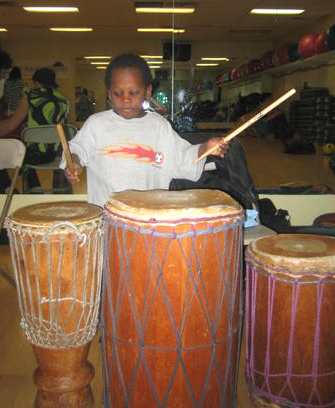 Dance/Drum Immersion: Students will focus on dancing and drumming. This focus is fun and active and the cultural education will happen through experiencing the form and personal interaction with master artists. Students will not perform, but will learn one or more traditional pieces (depending on time). This is a great choice for PE teachers. Cultural Education focus: Students will have extra time for question and answer sessions and discussion about the culture of West Africa. They will learn the names of several instruments, see traditional dress and accoutrements, learn about the role of dance and drum in the community, and see images of life in W. Africa. Performance focus: Students will focus on learning a choreographed piece to perform for their peers and/or parents. Additional performance fees apply (see price list). West African style ballet performance: An extension of the performance focused package described above, students will have time work with Jeh Kulu artists to create a well rehearsed performance including the added elements of theater and song. Option to create costumes may be available with school support. Additional performance fees apply (see price list). Performance and cultural education: Combination of performance and cultural education focused packages described above. Residencies will begin with a focus on cultural education and move into preparations for a performance. Additional performance fees apply (see price list). Lessons and free printouts from Boston U.